The Finger Lakes region of Upstate New York encompasses a group of lakes that look like – you guessed it – fingers. From water sports, hiking, biking and picnicking amid stunning geographical features to an amazing winery scene, the southern Finger Lakes region has tons to do (and eat!) for families, or for a girlfriends’ or romantic getaway. My family visited the area courtesy of Corning and the Southern Finger Lakes, and I’ve got a perfect four-day itinerary to help you hit some of the highlights! We’ll start in Hammondsport (at the southern tip of Keuka Lake), move to Watkins Glen (at southern Seneca Lake), and then on to Corning and Elmira. 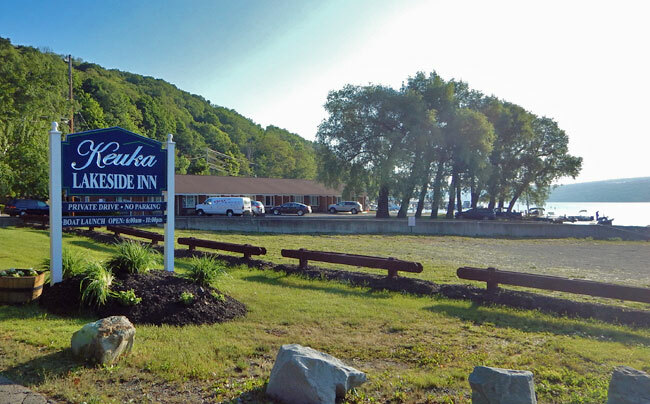 Keuka Lakeside Inn is the perfect spot to call home during your visit to the southern Finger Lakes. Keuka Lakeside Inn is a charming property right on the southern shore of Keuka Lake. The recently renovated rooms are clean and comfortable and include a mini-fridge, free wi-fi, and television. In front of the Inn is a beautiful patio, gazebo, and fire pit right next to the water. In the evening, guests gather to drink wine, make smores, share stories, and watch the moon rise over the water – an experience not to be missed! 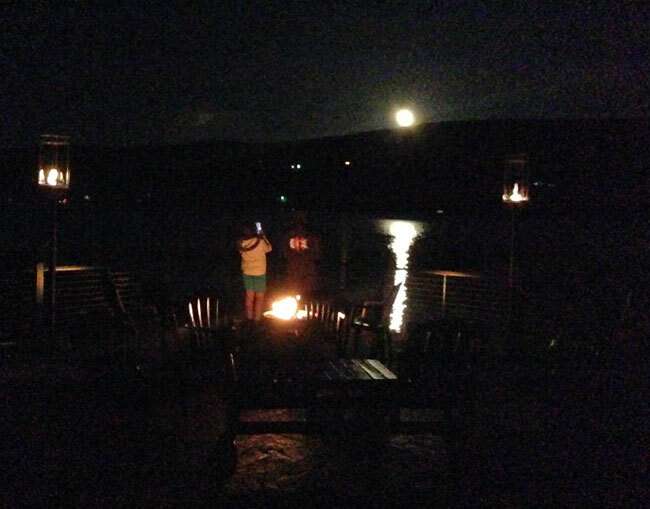 Watching the moon rise over Keuka Lake. Upon waking, take an early morning walk to the Village Square – just one block from the Keuka Lakeside Inn – for coffee and a breakfast sandwich at Keuka Bakery Company. Then head back to the lake to kayak. 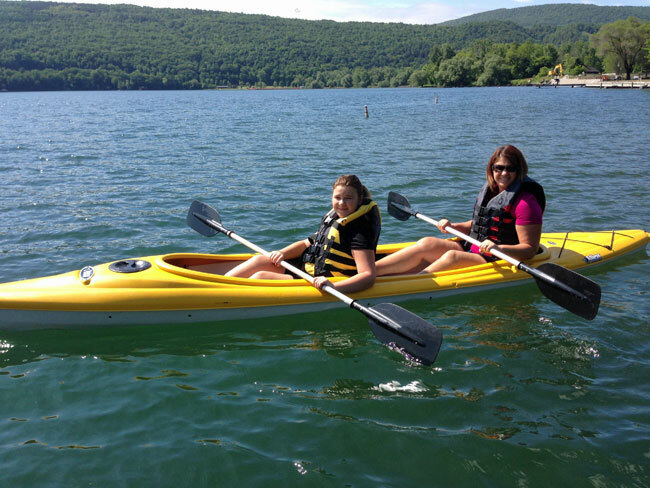 Keuka Lake Kayak and Bike Rentals will drop off kayaks, PFDs and oars right at the dock in front of the Inn. My daughter and I had a peaceful paddle around the lower portion of the lake and even had an encounter with some adorable baby ducks. 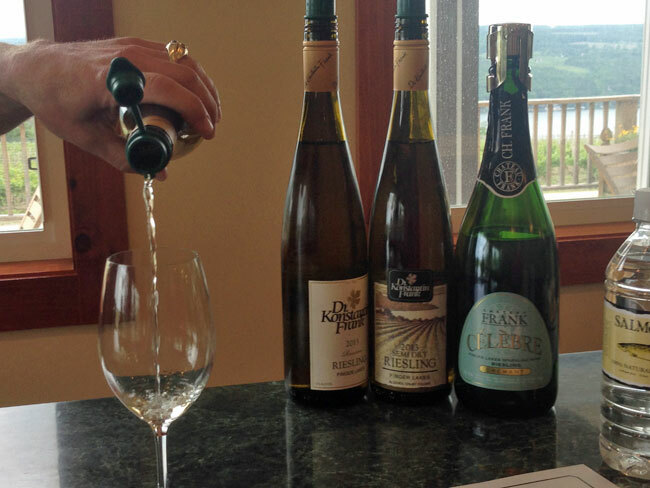 When you’ve had your fill of the lake, head to Dr. Konstantin Frank’s winery, just up the road from Hammondsport. Dr. Frank pioneered the successful growth of Vitis Vinifera vines – which produce spectacular Reislings – in the cold climate of upstate NY. Dr. Frank’s tasting room is open daily and the views of Keuka Lake from the hilltop are as delicious as the wine. Enjoy a taste of Dr. Frank’s wines while looking out over Keuka Lake. I highly recommend Union Block Italian Bistro in Village Square for dinner. All the food was fantastic, but my side of white truffle mashed potatoes was one of the best things I’ve ever tasted. And don’t skip dessert – they make an incredible whipped cream. My whole family was fighting over it, so our server brought us a bowl to share! 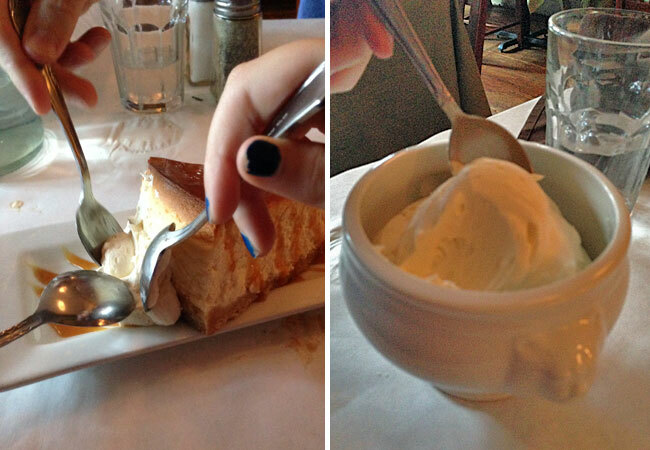 We all fought over the whipped cream at Union Block Italian Bistro. If you have an extra day in the area, I’d recommend spending it on Keuka Lake in Hammondsport. It’s one of the most relaxing towns I’ve visited. On your way out of Hammondsport, stop in to the Glenn H. Curtiss Museum. Curtiss was an aviation pioneer who flew the first public, pre-announced flight in America right off Keuka Lake in July, 1908. Although the Wright Brothers had already made their historic flight, they had not done so publicly. Curtiss piloted his “June Bug” flying machine 5,090 feet, allowing the public to view aviation for the first time. He also built bicycles and motorcycles, and the museum houses an eclectic variety of antique planes, bikes, cars, boats, fire engines, home furnishings, tools, toys and many other unique items. It’s a fascinating place chock-full of memorabilia and history. Drive about a half-hour east from Hammondsport to Watkins Glen, at the southern tip of Seneca Lake. Stop at the Glen Mountain Market Bakery & Deli and pack a picnic lunch, then head to Watkins Glen State Park. Along two miles, the glen’s stream descends 400 feet over 200-foot cliffs, generating 19 waterfalls along its course. The gorge trails take you over, under, and through the waterfalls for an incredible day of hiking. The park also has an Olympic-size pool, picnic and camping facilities, and fishing – good to know, since you will undoubtedly want to return for a longer visit! In 2015, Watkins Glen State Park won third place in the USA TODAY Readers’ Choice Poll for Best State Park in the United States. 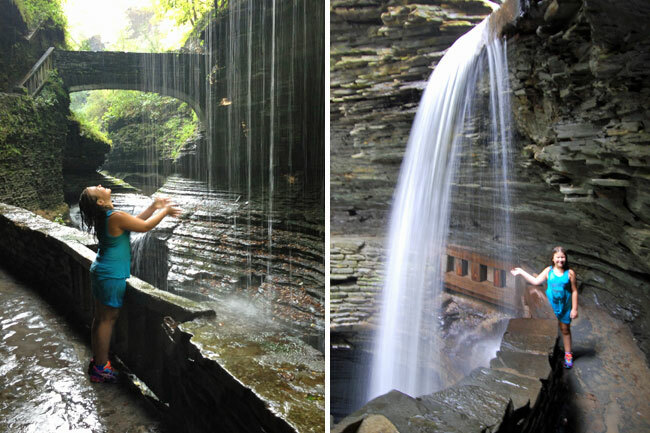 My daughter got a *little* wet on our hike at Watkins Glen State Park! Hungry for a treat after your hike? I recommend The Great Escape Ice Cream Store, located just south of the park, for excellent homemade ice cream, gelato, and even vegan ice cream, with unique flavors like Maple Bacon and Red Velvet Cheesecake. At the end of this busy day, you’ll drive a half-hour south to Corning, NY. I recommend a room at Staybridge Suites. Their two-bedroom units give a family plenty of space to spread out, relax, and enjoy a little privacy. 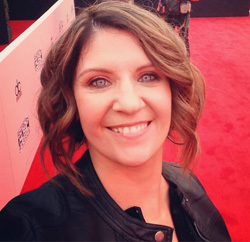 It was perfect for my family – the kids could sleep in when my husband and I needed to get up early and do some work. Spend the day at the world’s largest museum of glass and explore 3,500 years of glass art and history. There are also plenty of hands-on opportunities for all ages. Watch a hot glass demonstration and even make your own souvenir. 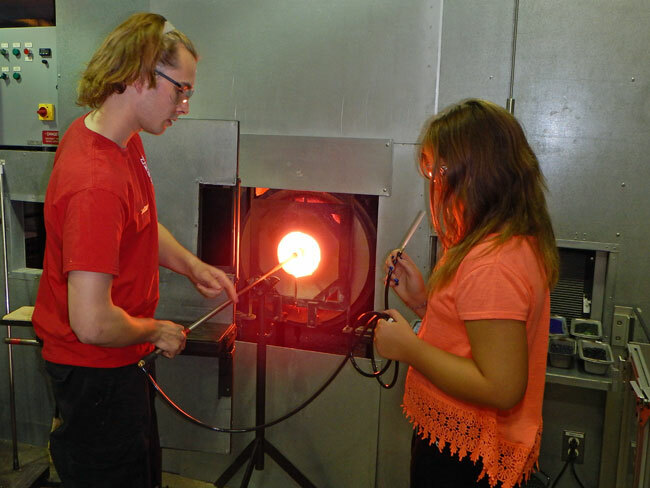 Read more about our experience at Corning Museum of Glass here. My daughter gets ready to make her own hot blown glass creation at the Corning Museum of Glass. Poppleton Bakery & Cafe: Charming cafe serving crepes, paninis, soups, and baked goods. Corning’s Gaffer District: Explore the 100+ shops, galleries and restaurants in downtown Corning. Park Ave Sports Center: Fun spot for families looking to burn off some energy before the day ends. Laser tag, mini golf, rock climbing, and more. Bring a towel to dry off after “Water Wars” – where opponents can launch water balloons at each other! A half-hour east of Corning is Elmira, NY, home to Historic Harris Hill – the Soaring Capital of America. We started our day with a quick visit to the National Soaring Museum, then we waited for the weather to clear so we could take a ride in a glider – a plane with no engine. We learned that Harris Hill offers a summer full of educational experiences for kids. 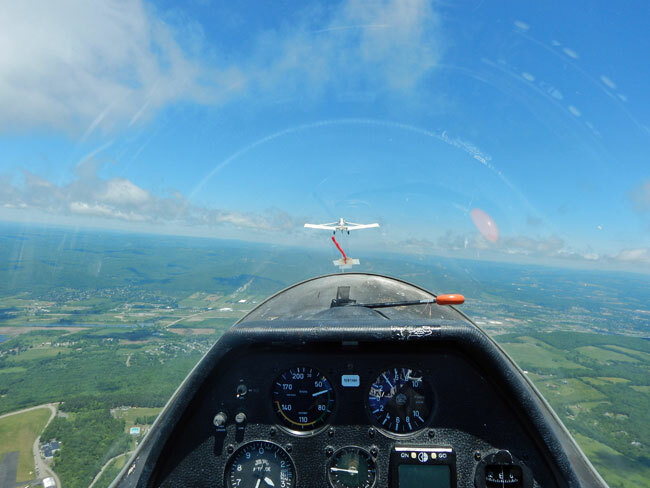 Programs provide exposure to aviation-related careers, aviation history, glider design and construction, and, of course, glider rides! Each person rides with a pilot – something to be aware of if your kids are young or nervous about flying without you. Both of my kids opted out, but my husband and I both went for it! When your pilot is ready, you’ll get into the front seat of the glider and strap in. 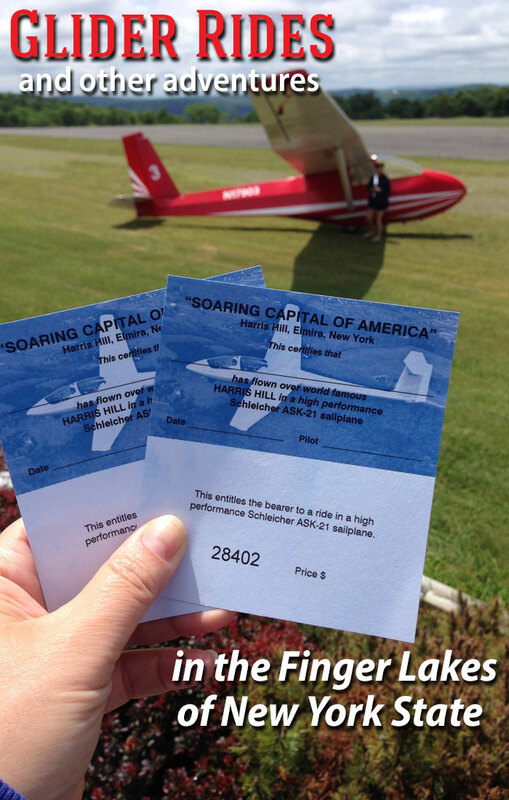 You’ll be pulled into flight by a small plane, then the tow line is released and you’ll simply glide through the air. My pilot talked about how quiet and peaceful the experience is. It’s definitely quieter than any other type of plane, but I could still hear the wind blustering around us, and I think I was a little too nervous to really feel peaceful! But after a few minutes, I relaxed and soaked in the astounding views. The ride lasts about 15-20 minutes as you float back to the ground. I am a bit prone to motion sickness, and toward the end of the ride I started to feel a little queasy. But it was nothing I couldn’t handle and we were on the ground soon enough. It’s an incredible experience, and I can’t imagine how gorgeous the views must be in the fall with all the colorful foliage! My view from the cockpit of the glider – just before the towline was released. Give yourself extra time if you want to take a glider ride – rides are on a first-come, first-served basis, and are very weather-dependent! The Southern Finger Lakes region of Upstate New York is the perfect backdrop for family adventures, learning about history, and enjoying nature. This four-day itinerary offers a small sampling of the many ways to plan a getaway that has something for everyone. We went over to update New York from our vacation in Burlington VT and I was impressed with how beautiful and rural it was. I would now like to go back and visit the finger lakes district of upstate New York, but I think I am too old for the glider ride.